This smoky vegan cheddar popcorn is the perfect snack, especially for movie watching with friends. I love going to the movies, don't you? I went to see Beauty & the Beast this weekend and thought it was fantastic! Watching a childhood animated favorite come to life with stellar acting was magical (pun intended). The only aspect of going to a movie in theaters that I don't particularly care for, is the typical snack selections. I love the smell of the freshly popped buttery popcorn but I don't love how my stomach feels after eating an entire bag. My homemade vegan cheddar popcorn is a low cal, healthier variation of popcorn at the movies with all the same satisfaction. It's made with air-popped popcorn and only takes minutes to assemble while the movie and blankets are queued up. The great thing about watching a movie at home is that you have total control over your own snacks and drinks PLUS your dog can cuddle up beside you on the couch. Therefore, watching movies at home is my favorite way to watch. This recipe is actually an adaptation of a version of popcorn my sister-in-law made for my husband and I once when we were visiting her in Asheville. She is an incredible healthy cook for her family, friends and other lucky families in the city. After a long night out on the town in Asheville, we came home in need of a midnight snack. She popped some popcorn then drizzled a bit of oil, salt, and nutritional yeast. I thought "that's interesting, I've never tried nutritional yeast on popcorn before". It makes total sense though, if you like cheesy, savory popcorn. It was AMAZING and I now sprinkle the same on my popcorn. I took her recipe a bit further and tried my favorite vegan smokehouse cheddar seasoning (which is the BEST on kale chips) on the popcorn. The flavor combo turned out to be dynamite! Smoky, cheesy, salty goodness without the empty calories, preservatives, or dairy that can be found in most pre-packaged popcorn. I try to keep some of this seasoning around so that I can sprinkle it on anything from kale chips, popcorn, broccoli, pasta, or anything that needs a bit of savory cheese flavoring. On your next movie night with friends, try this recipe out, you may have to pause the movie to make more! 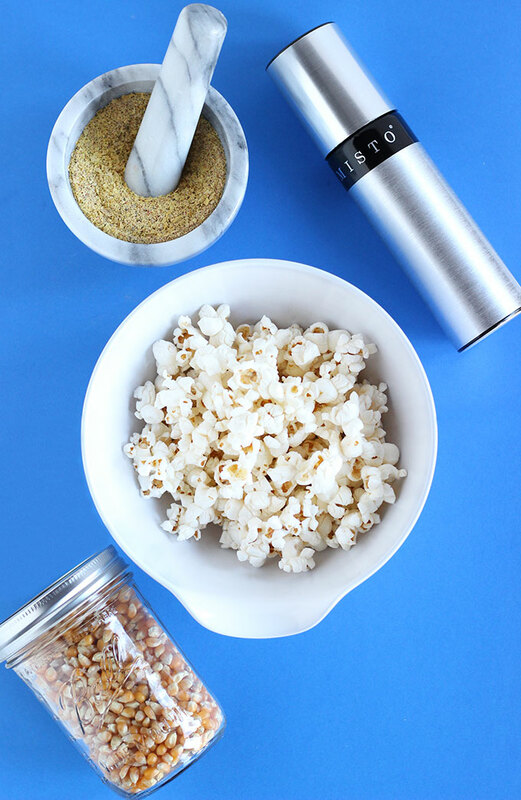 Take 1/4 cup of popcorn kernels and put them into your air-popper to pop. You could also use any alternative popcorn method to produce freshly popped corn, as long as no flavor or seasonings have been added. Once you've popped your corn, sprinkle or drizzle about a tablespoon of oil (I love using our Misto). I would suggest using a neutral-flavored oil like grape seed or canola. I wouldn't recommend olive or coconut oil, as they would definitely change the flavor. 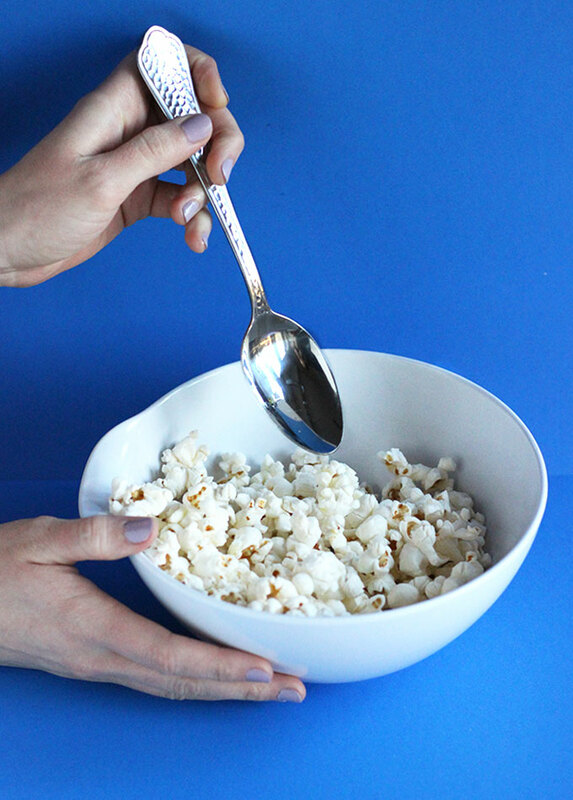 Then, you'll want to take a spoon and gently fold the popcorn around in the bowl so that all the kernels are coated with oil. From there, sprinkle about 2 tsp. of sea salt and 1/4 cup of the vegan cheddar seasoning. The full recipe for the seasoning is below, but it's only 5 simple ingredients: nutritional yeast, paprika, pepper, onion powder and garlic powder. Again, take the spoon and carefully mix the popcorn around so that all the seasonings stick to the oil. That's it! Serve up for movie time. Note you can definitely adjust the level of oil/salt/seasonings to your liking. My recipe is just a suggested starting point for how we like to season our popcorn. Do you make homemade popcorn? If so, what are your favorite toppings/seasonings? Comment below and let me know!